Are these seats a direct bolt on to the factory seat brackets ( 89 gt hatch) or will I have to buy new? 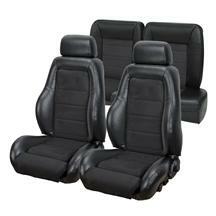 This kit comprises new seat foam for the front seats and new upholstery for front and rear. You would reuse your factory seat frames and brackets etc, so everything would bolt up fine. Thanks!